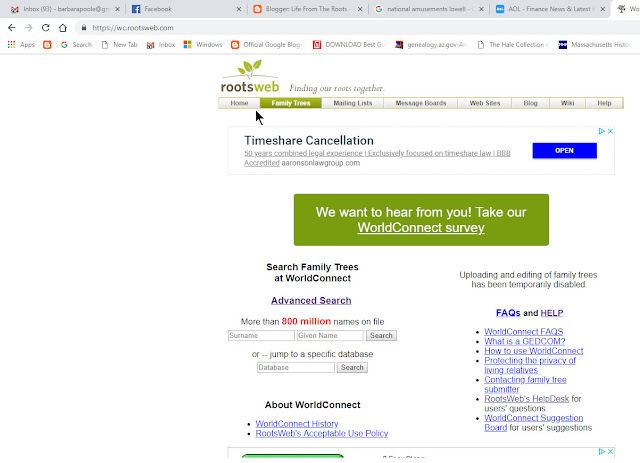 The Ancestry.com program RootsWeb / Family Trees also known as WorldConnect has not worked for almost a year! About 11 months to be exact, because last December 17th, there was a major malfunction, and my tree is frozen in time, because there is no way to edit or remove it, and Ancestry is still working on the problem. So what does that mean to me? To you? To those of you who find my information through Google searches, you could be receiving incorrect information, because as I already mentioned, I can't update or make corrections to that tree, so why would you want to use it? If I had a relatively small tree and everything was perfectly sourced and correct, I wouldn't worry. But, I've got over 45,000 names, and the tree was begun 29 years ago. I usually updated it every other week. Updating was easy, I made a new GEDCOM and used the update features on RootsWeb to get the information to the web via Ancestry. Normally, I love to share my information, however, for all these 11 months, I've made probably 400 or more additions or corrections in my genealogy software. But, you won't see the corrected files. 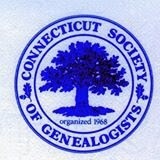 The minute Ancestry.com fixes the problem, I can repost an updated GEDCOM for you to receive the correct information online or through a Google search. 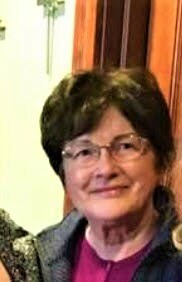 I've deleted my tree from several DNA related sites, such as GedMatch and Ancestry's DNA site, for the reasons mentioned. If you are curious about RootsWeb's WorldConnect Project, go to www.RootsWeb.com, and you will get the page shown below. Click on the second tab that says Family Trees, it opens to the diagram below. Normally, currently, you have two search options. 1. Put in a name. 2. Type the database you want to look at. In the past there were other options like, edit or submit your tree. Remember, be careful using trees that haven't been updated since December 17, 2017 because owners may have made corrections. There are a huge number of people who haven't updated in years, so be alert to that. While going through old files, I came across early printout of what an early (2003) RootsWeb page. I used it and the other examples below in several of the genealogy classes I taught.